In today’s supply chain, the only constant is change. Disruptions, whether short-term like a forklift failure, or long-term like a natural disaster, are a fact of life. The supply chains best prepared to adapt to these disruptions will use mobile computing technology that gives them greater flexibility. In today’s supply chain, the only constant is change. Disruptions, whether short-term like a forklift failure, or long-term like a natural disaster, are a fact of life. The supply chains best prepared to adapt to these disruptions will use mobile computing technology that gives them greater flexibility. The Thor vehicle-mount computer (VMC), the tenth generation of VMC developed by Honeywell, provides unprecedented flexibility, and with it, breakthroughs in supply chain productivity. 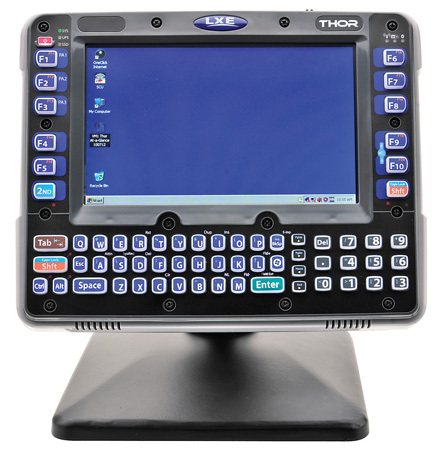 The Thor combines a fast 1.6GHz Atom Z530 processor, WWAN, WLAN, and Bluetooth® wireless connectivity, and a Microsoft® Windows CE 6.0 or Windows® Embedded Standard operating system, with three breakthrough innovations that can create immediate time savings and productivity gains. A field-replaceable front panel empowers the end user to repair the most common breaking point of vehicle-mount computers, or convert a standardtemp unit to a freezer-ready unit, in a matter of minutes, with only a screwdriver. The Thor’s Quick Mount Smart Dock separates the computer from the power supply, letting a user undock the unit from one forklift and redock it on a second vehicle, without missing a single transaction. And the Thor’s ignition control feature allows the user to set power management preferences to save startup time and extend battery life. Dramatic productivity gains become possible when innovation shatters conventional thinking, even in the most challenging environments. Ready to see how the Thor can change your enterprise?